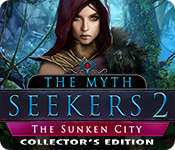 The Myth Seekers 2: The Sunken City Collector's Edition is rated 3.8 out of 5 by 14. Rated 5 out of 5 by patricia356 from Interesting and entertaining Based on playing the excerpt only. Since I did not play the entire game I am not able to comment on the length or extra game. What I did play I enjoyed immensely. The graphics were great as were the voices. I always play the demo in easy but I think this one definitely could be bumped up . It seemed a little too easy. The pace of gameplay is good. It just seems to keep moving at an interesting pace. I thought some of the negative reviews were unwarranted with regard to just the quality of the game regardless of the length. I think that if you try it out you will want to buy it even if you wait for the SE. Rated 5 out of 5 by LikeAGoodStory from Well Paced Game With Excellent Story Artifex Mundi may be my all time favorite developer and of late, they are introducing us to other developers, in this case, Sunward Games. We are the more fortunate for it. They do an excellent job with this story, dropping in some great plot twists so there is solid game play and sensible tasks. The music complements the storyline, and I really enjoyed listening to it. I found the graphics better than average and not distracting. 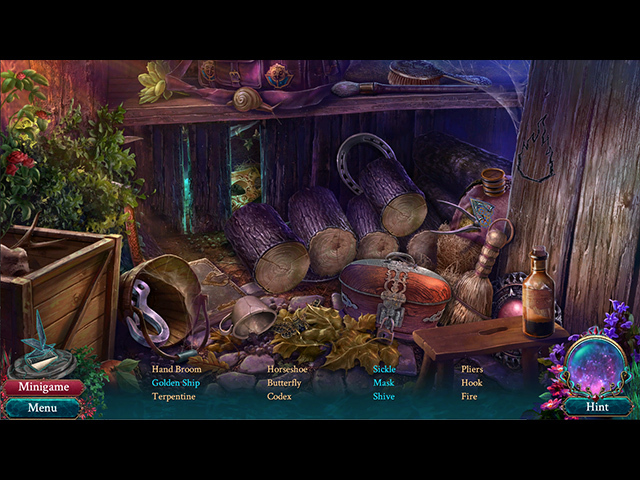 For the first time in a long time, I enjoyed the hidden object scenes, looking for objects and interacting. They were integral to the game, just like the minigames. I am not big on collectibles (and there are no morphs to find); in this game, collectibles were quite obvious so little challenge. The game does seem to offer an interesting set of achievements. My review is based upon completed play of the main game. I have to yet to play the Bonus Chapter but am looking forward to it. It is a prequel. Rated 5 out of 5 by biscuitsmama from FIND THE SECRETS OF YS TO SAVE PARIS The Sunken City is the second game in the Myth Seekers series and, at least for me, it is much better than the first game. The Sunken City takes place four years after your search for Vulcan’s Hammer that was featured in the first game. As with that game there is a lot of mystery as you search to unlock the secrets of the ancient kingdom of Ys. Since anything to do with ancient civilizations is one of my passions, this game was an instant purchase for me. Even though the overall game is excellent with a storyline that kept me wanting more as I moved through the game, I still felt that the graphics tended to be sub-par. The characters seemed flat and at times rather cartoonish many of the scenes lacked the depth and detail that are found in games by other developers. That being said, the storyline and the mini-games made up for the deficit in graphics. The HOPS scenes highlighted the deficit with the graphics as they were very grainy and misty, which made the items difficult to spot. Although there is an alternate matching game available it was almost more difficult than finding items in the scenes so it was rather useless and, as a result, I did need to rely on the hint button several times in order to complete the scenes. The MINI-GAMES were fun but once again we have a game where there are far more mini-games than there are HOPS. Some of the mini-games are challenging but most seem to be easily solvable so there is at least something for everyone. Another weakness in the game is that the Strategy Guide does not include complete information on solving a mini-game but only shows a graphic of the solution and even though you know what the solution looks like, the guide does not include the steps required to get there. IMHO, this makes the Strategy Guide unnecessary. As I mentioned the storyline is excellent and the gameplay kept me engaged I happen to enjoy moving back and forth between scenes when playing a game so that I actually need to use my brain to remember where an item should be used. Because I enjoyed the overall game (which made it worth 5 stars) I can overlook the graphics as being a minor irritation. For me the game seems quite long as I have been playing for several hours and have not yet played the bonus game. Even though I did purchase the game, I always recommend that you try the demo to see if the game is one you will enjoy. Happy gaming! Rated 4 out of 5 by Majestyx12 from Lutetia (Today's Paris) Based on the finished game with bonus material. In the game Lutetia was a begone city with myths. I did look it up on the net and it has something there. The game has magic. It takes place in 1933. My friend that I graduated with is acting funny. I liked the game but the gameplay for me was hard in chapter 6 and especially in the bonus chapter. I didn't know what they wanted and where. I limped with the hint button to finish. I really liked the rest of it. So maybe it's me. I think the game is beautiful and it looks great on my full HD 1080p LED monitor. I collected 27 tribal symbol masks. The bonus chapter is a story from Ys. A boy and his beloved animal. The 8 wallpaper is just scenery and it's beautiful. You can replay 8 hops, 8 cut scenes and 8 mini-games. Their were more things they could have added and I don't know why they chose only these things. They have just the word More on their list of things to access. It had the achievements and the collectibles in it. I liked the first game in this series more. The Legacy of Vulcan. Rated 4 out of 5 by heartblob from myth seeker, well keep looking, wont take you long. enjoyable game but so SHORT did you get bored making this game , honestly I can not believe that it was a collectors edition just so boringly short, yes I have seen the good reviews, but you have to expect more from a collectors ed Well I did, I recommend the game as it is good game play and for a beginner probably long enough. Rated 4 out of 5 by sunnyglow from SAVE PARIS BEFORE THE POWER GOES OUT! REVIEW BASED UPON THE ENTIRE GAME: 6 Chapters Plus a Bonus Chapter – Strategy Guide: 67 Pages OVERVIEW: As part of the Myth Seekers, you, Amelia, are off to help your friend, Marlene. After discovering an amulet during an expedition, Marlene’s colleague becomes comatose and is returned to the Myth Seekers headquarters in Paris. This amulet contains hidden power and secrets tied to an ancient civilization, Ys. Now you and Marlene are off to learn the history of this sunken kingdom and its rival, Lutetia. Along the way, you will save Paris and the world from an evildoer out to harness this power for personal reasons. OPINION: The story behind the game is excellent. The demo does not go into much depth concerning the story. There are more characters added and more history disclosed after the demo. The pace is decent although there is a great deal of back-and-forth action between scenes retrieving inventory items. The game is beautifully illustrated with some breathtaking scenes. Despite the number of chapters and lengthy strategy guide, the game is of average length. MECHANICS: • There are four (4) levels of play including a customized version. • There are twenty-eight (28) achievements – eighteen (18) for story and ten (10) for skill. • Collect twenty-seven (27) masks - one per scene (Very large and easy to locate) • Eight (8) wallpapers along with concept art and cutscenes. • Replay eight (8) HOP scenes and eight (8) mini-games BONUS CHAPTER: It is a prequel. Join a young apprentice baker with a pet ferret, Miffy, as he plans his escape from the island of Ys. Continue collecting the masks in this chapter. There are four (4) mini-games and two (2) HOP scenes in this chapter. 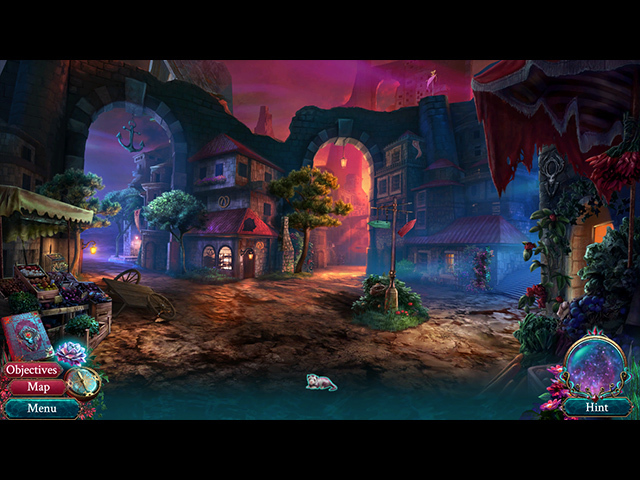 The whimsical style of this chapter (with the inclusion of the “cutey” ferret) provides a contrast to the life-and-death struggle from the main game. HOP SCENES: There are only thirteen (13) HOP scenes in the game. Two of these are questionable as to whether the developer considered them HOP scenes. Most of the scenes are lists of items or silhouette. They are somewhat interactive. There is one FROG scene. A matching puzzle can be played in lieu of the scenes. MINI-GAMES: There are thirty-one (31) puzzles within the game. They vary in difficulty and style. Most of the puzzles are those seen in other games. 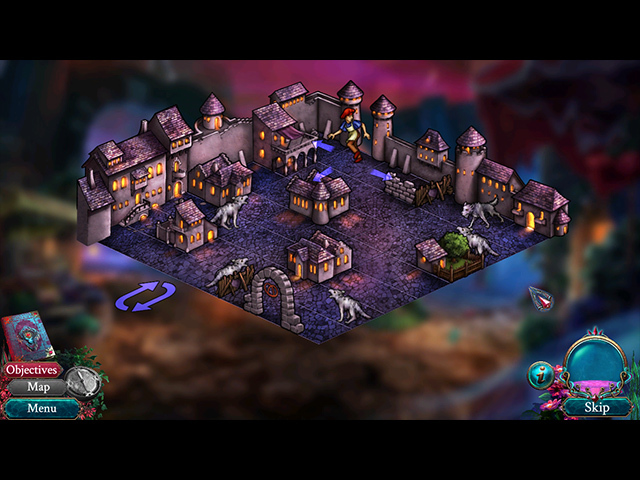 However, for the most part, they are creatively designed and thematic to fit the theme of the game. There are some puzzles which involve interacting with pages within a storybook which seemed more like HOP scenes than puzzles. SPOILERS: HERE ARE SOME OF THE MINI-GAMES AFTER THE DEMO: A. Sliding tiles puzzle. Slide Druids into position so that the emblems on their torches match the two emblems on both sides of them. B. Dot-to-dot puzzle. Connect dots on a grid without retracing steps. C. Rotating tiles puzzle. Rotate triangular tiles to restore an image. D. Map puzzle. Follow instructions to lead a ship to its port. E. Logic puzzle. Choose between 3 musical notes (each of which has a specific number of spaces assigned to it) to move a bird to a space with an amulet. There are only 8 moves. BONUS CHAPTER: F. Map puzzle. Move through the streets of a town to a bakery while avoiding wolves. G. Paint-by-number: In this case, color the icing on a cake according to given directions. H. Physical puzzle. Navigate through water to shore while avoiding rocks. Use left-and-right arrows to steer the boat. Rated 3 out of 5 by Kay_Erin from I liked it - better than the first! An excellent long game. It was challenging without being too much. It took me a long time to play, although the bonus game was much shorter, it was interesting - I kind of think it was a cross between a prequel and an up coming story line. I agree with another reviewer; this is almost a "bling-less CE" in that the only collectibles were 4 or so different sets of masks, which I found odd and they never showed what the connection between the ancient city and the masks was. Anyway these collectible were not worth anything and they don't allow you to go back and find them anyway, so Pffft! I gave this 3 stars because of the fun time I had playing the main game, but took 2 stars off for posing as a CE;but really, I would give it 5 stars as an SE They did add a cute animal to the bonus chapter. I'm a fan of animals and don't think they take away from my ability to play a game well. So I liked that, and it made paying for a CE less painful;) Bottom line: if you are a completest and want the CE go for it, but in actuality the SE will give you more bang for your buck.